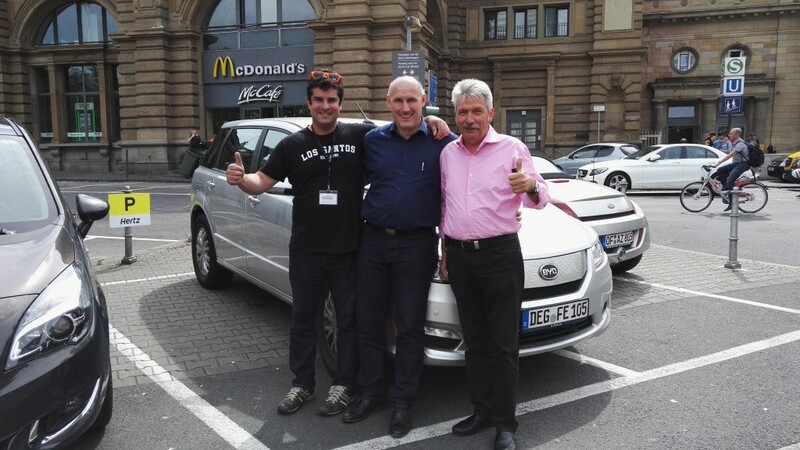 We would like to thank Thomas Rück of Oekolife energy in the middle who organised the perfectly functioning electric vehicle that took us over the finish line. A very special thanks to our technology sponsor AGM Telematics for setting up the real time vehicle tracking service that gathered a detailed assessment of our progress and travel statistics. This enabled all the schoolchildren to follow our progress online and engage in technology and innovation in real time. The total amount of miles is calculated using our sponsored ROUTEMASTER GPS Sat Nav monitoring system installed in the car by AGM Telematics. The total recorded mileage was 2338, with a top speed recorded of over 88 mph. The system records and provides the data necessary to display the full dynamics of the road trip down to an amazing detail in real time using an online map and software platform. The way the driver is performing and manoeuvring is calculated, as the system contains G force sensors that constantly monitor the dynamics of the cornering, braking and acceleration. 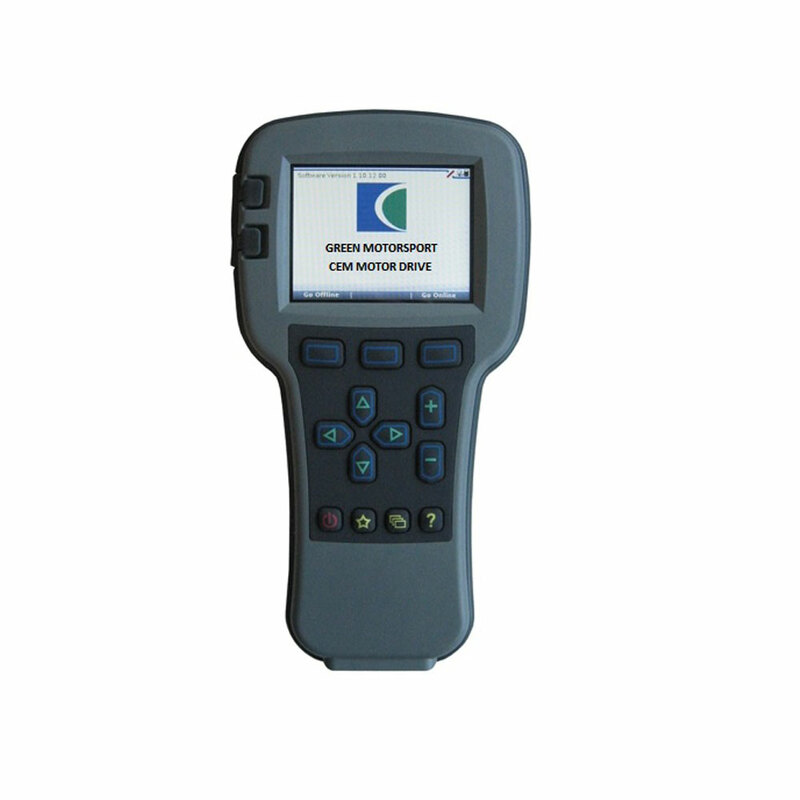 The system enables the monitoring team to judge the driver’s skills and potential dangers created by the driver and any potential driving errors that may endanger the goods or people. The BYD electric car’s performance is very surprising. The data we have collected estimates the range of the car to be 320 km per charge and a top speed of 160km/h, 0-60 in 8 seconds. The car also has a very novel charging system that can be connected to one’s home to offset the power on the grid to reduce energy bills. The car also has the ability to rapid charge in 40 mins or less but currently this is only possible using the 100 KW + BYD fast charging stations. The trip confirmed that the car is what they say it is and the stats we collected confirm this independently. 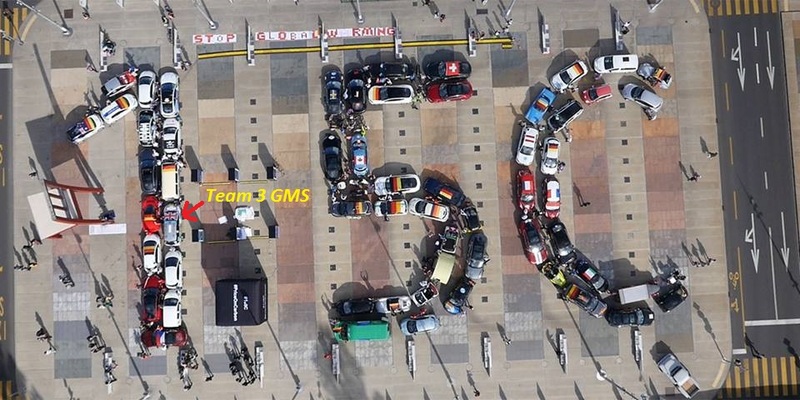 All the teams on the rally were powered by renewable energy with each team investing in what they consumed during the rally. 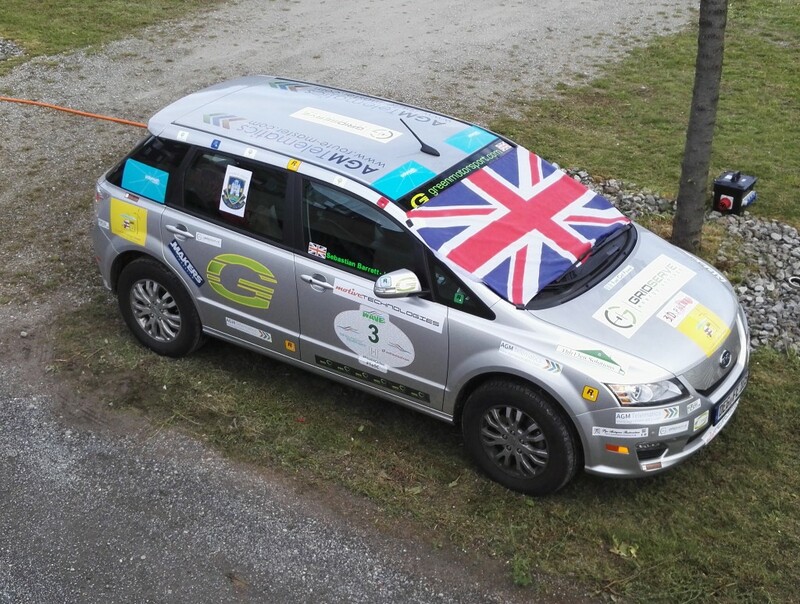 The Green MotorSport team 3 car was powered from the energy that was collected by the Moss Solar Trust using a large privately owned photovoltaic array situated in Surrey. 775 kWh of energy was consumed to drive 2338 miles. The cost of running our entry was calculated using the average price of energy per kWh at £116.25. 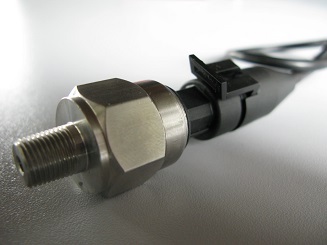 The cost of running a petrol equivalent would be around £280-£300, a grand saving of £160 or more! A great saving and 100% carbon dioxide savings, as well cutting out other toxic gasses associated with the burning of petroleum. The new Chinese E6 BYD electric car was simply fantastic and we wish every success to the BYD company for this introduction to the electric vehicle market. The car would make a perfect fleet car and you can forget range anxiety as this car just keeps going and going! With a range of over 200 miles it ticks all the boxes. The fact that it can be used to charge other cars or even your own home is a major plus point and we expect to see real benefits for any new owners globally. Once in Geneva on the 17th June all the WAVE teams headed towards the United Nations with the mission of delivering the climate change pledges. 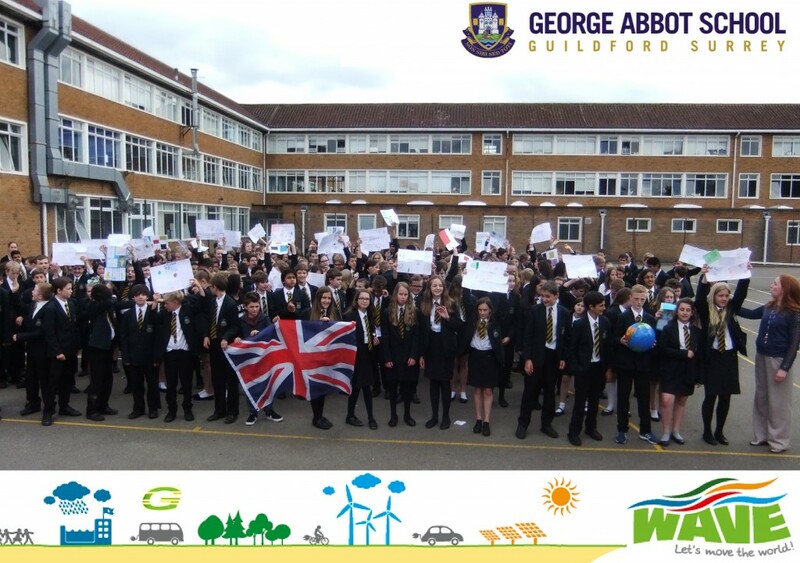 We delivered the UK pledges supplied by George Abbot School in Guildford, Surrey who prepared over 300 individual environmental pledges towards the global event. 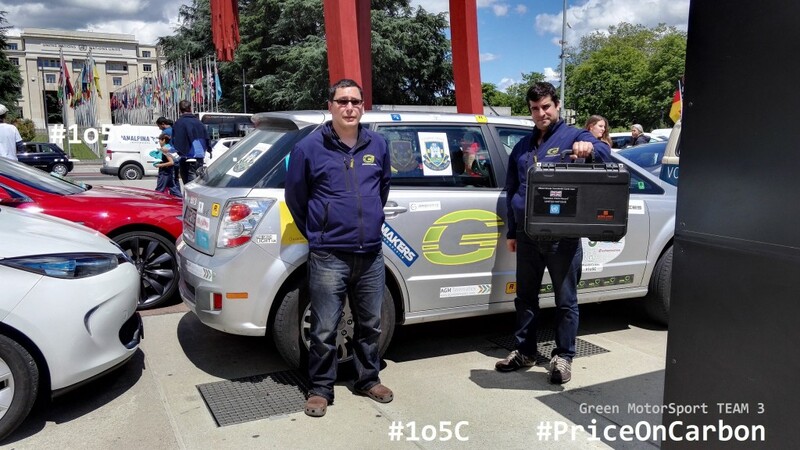 The official Climate Commitment Cards case made by Action Cases was carried from the start of the WAVE rally all across Germany in our electric BYD car to Geneva where the pledges were unpacked and displayed outside the UN with all the other international pledges making up a huge collage. 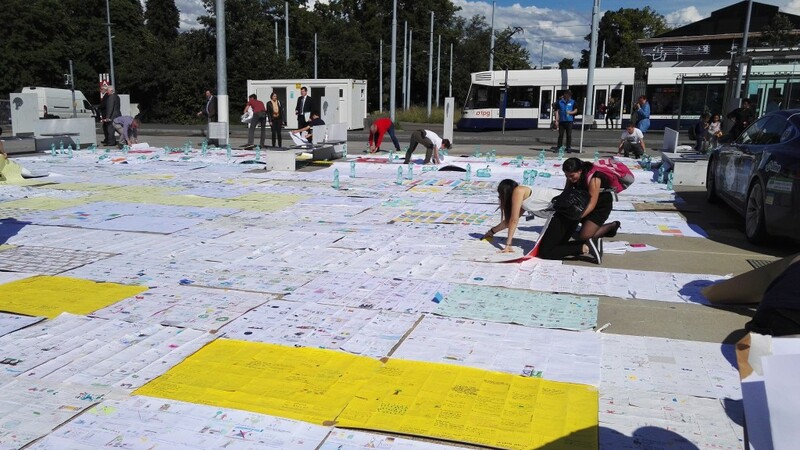 The WAVE teams delivered the cards from thousands of schoolchildren from around the world asking the United Nations to avoid the risk to their future of climate change. The winning country in the WAVE Earth competition was the Czech Republic, which sent with the help of Yaromir, a member of the WAVE support team, a whopping 9,000+ cards to Geneva. All the cards were laid out in a massive display, which was photographed and relayed around the world by a drone. 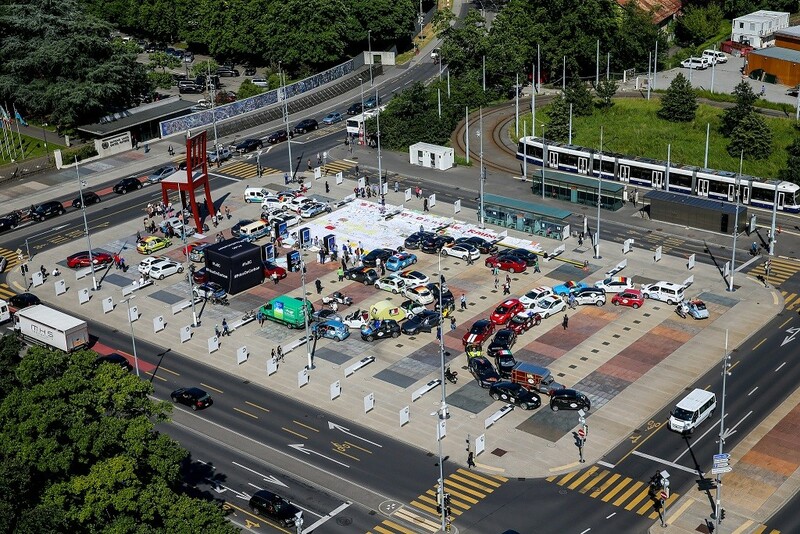 The WAVE cars in the rally were all grouped together to make up the 1.5C image directly in front of the Geneva HQ. As the electric vehicles powered by the sun, wind or wave arrived in Geneva we were greeted by Adam Rogers and Maria Louisa, Director of the Geneva office of the United Nations Development Programme (UNDP). We were also welcomed by the WAVE Earth Ambassador H.E. Elayne Whyte Gómez, Permanent Representative of Costa Rica to the United Nations. 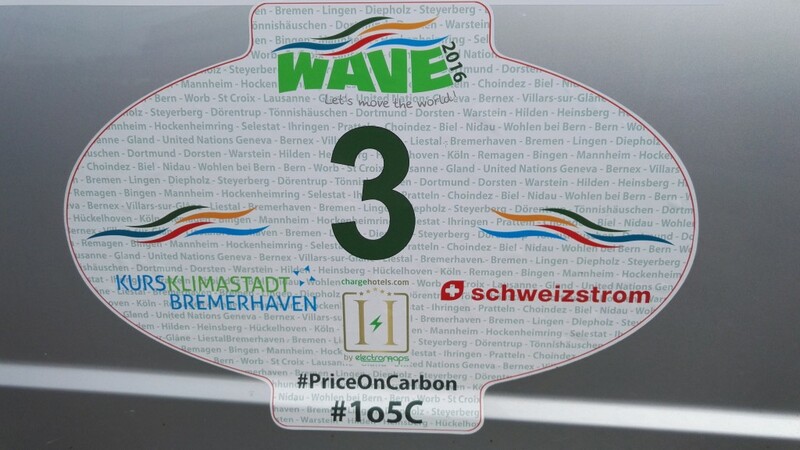 The electric vehicles participating in the WAVE were also photographed from a neighbouring high building, as they formed “1.5C”. This showed our commitment to reducing the level of global warming to the lower level agreed at the Paris meeting. Many people ask if it really matters if the global temperature rise is 1.5°C or 2°C, but climate scientists are pointing out the impact of even small rises. Ricarda Winkelmann, co-author of a report by the Potsdam Climate Impact Research Centre (PIK), said that for the Earth system, half a degree really matters. 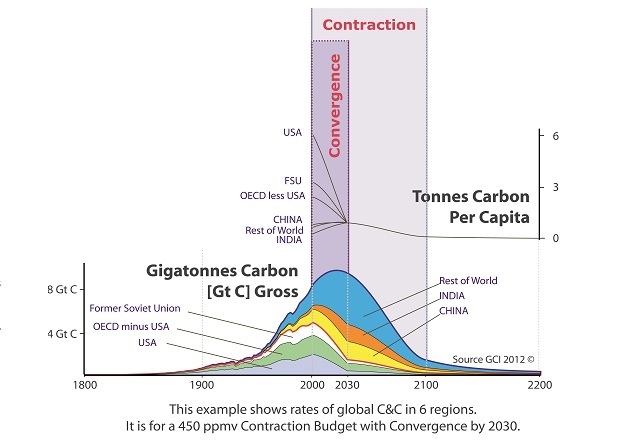 Warming of only 1.5°C above preindustrial levels will have major consequences and the difference to 2°C is substantial. Science and evidence calls for keeping warming to a minimum to help communities survive and thrive, leaving 1.5°C as the only sensible choice for the international community. The 1.5°C goal represents the best chance to fulfil the objective of the 195 state party UN climate change convention (UNFCCC) to prevent dangerous interference with the climate system. Gordon Foat and Seb Barrett James successfully navigated WAVE 2016 Trophy. 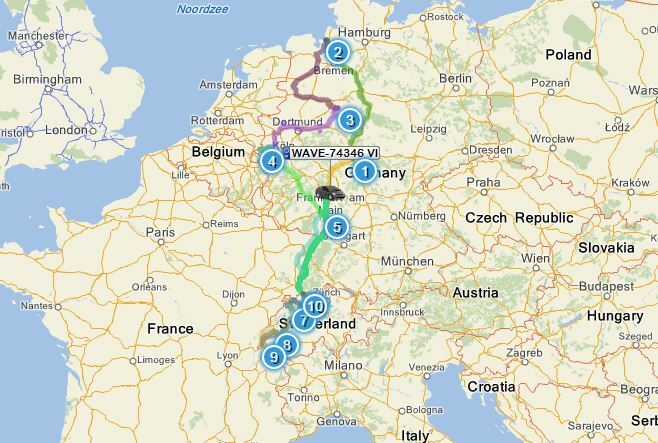 The map shows some of the Data from the tracking system installed on WAVE team 3 car entry. The full journey plotted using our AGM telematics system. Once again many thanks to our kind sponsors for helping our team get over to GENEVA and make this happen! 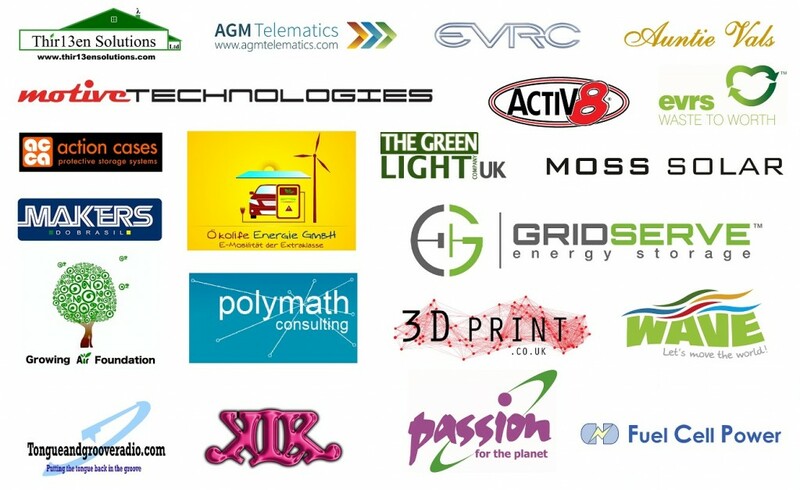 AGM Telematics : EVRC : Auntie Vals : Motive Technologies : Activ8 : EVRS : Action Cases : Okolife Energie GMBH : The Green Light Company : Thir13en Solutions : Moss Solar : Makers Do Brasil : Polymath Consulting : 3D PRINT : GridServe Energy Storage : Fuel Cell Power : Tongueandgrooveradio.com : Kele Le Roc : Passion for The Planet radio : Growing Air Foundation : George Abbot.